After a mild winter, I've already had a few glimpses of spring and it's only the beginning of March. It's so wonderful! As I start to change my wardrobe from winter to spring, I'm also thinking about some of my favorite scents for spring and summer. Although some women have a signature fragrance that they use every day of the year, I prefer to mix things up a bit in warmer weather. Lighter fragrances are better in the summer in my opinion. Spring and summer mean something light, fruity, and crisp. Many fragrances have special summer formulations with that are sun safe and won't cause hypersensitivity to the sunlight. Twirl from Kate Spade is a delightful scent that is fresh and sweet without being too overpowering. According to Kate Spade's website it is pink watermelon mingled with blackberry and red currant. Trust me, you'll love the end result. I was fortunate to find a holiday gift set of Twirl with perfume, body lotion, and shower gel for the price of the perfume! What a find. Escale a Pondichery from Dior reminds me of an old school, elegant perfume. I think that Grace Kelly would have loved this. The scent lasts a long time on your skin, significantly longer than other perfumes I have. It's perfect for an elegant summer evening. I love to layer this fragrance with my Dior Addict Shine lotion...just a touch of sparkle and a nice twist on the scent. This perfume is somewhat difficult to find, but you can order it from Nordstrom. As an added bonus, Nordstrom is having the famous Trunk Show later this month, so be sure to ask about special gift sets or gift with purchase opportunities during this event. L'Eau D'Issey Summer Fragrance. Ok, so I'm incredibly partial to anything in a pretty package, especially one that is blue with orange coral on it. This perfume is incredibly light and fresh and smells delicious. If you like any of the other Issey Miyake perfumes, you'll love this special edition. 212 VIP from Carolina Herrera is a recent find in the Duty Free Store at the airport. I've tried several variations of 212 over the past few years including 212 On Ice and the original Carolina Herrera 212 and love 212 VIP the most of all. It's funny, but the majority of my perfume purchases come from Duty Free Stores. Of course, I can buy perfume anywhere at anytime, but it's become a tradition to pick up a little treat when I'm headed on vacation to somewhere fun. Squeeze from Lilly Pulitzer is no longer being produced, but you can still find this light, summery citrus scent at wonderful prices online. When Lilly Pulitzer released the three limited edition frangrances, of course I needed all of them, but this is the one that I love and wear the most. Fun Pink and Green Confession...a loooooooong time ago, I saved my allowance long enough to purchase my very first perfume. Any guesses as to what I bought? While you're guessing, here's a peek at my spring and summer fragrance collection. Ready to guess? My first perfume was Liz Claiborne perfume in the red triangle bottle! Of course, it was oh so chic at the time. Meanwhile, all of the cute boys were wearing Polo, from the green bottle. What was your first perfume? What is your favorite perfume today? I have seen a lot of Lilly Pulitzer perfume at TJ Maxx recently. I was able to pick up Wink! I wear Kate Spade Twirl or Ralph Lauren Romance... those are the only two I own. I used to wear Vera Wang (the original one) all the time. My first perfume was Fendi Fantasia. Oh how I loved that. 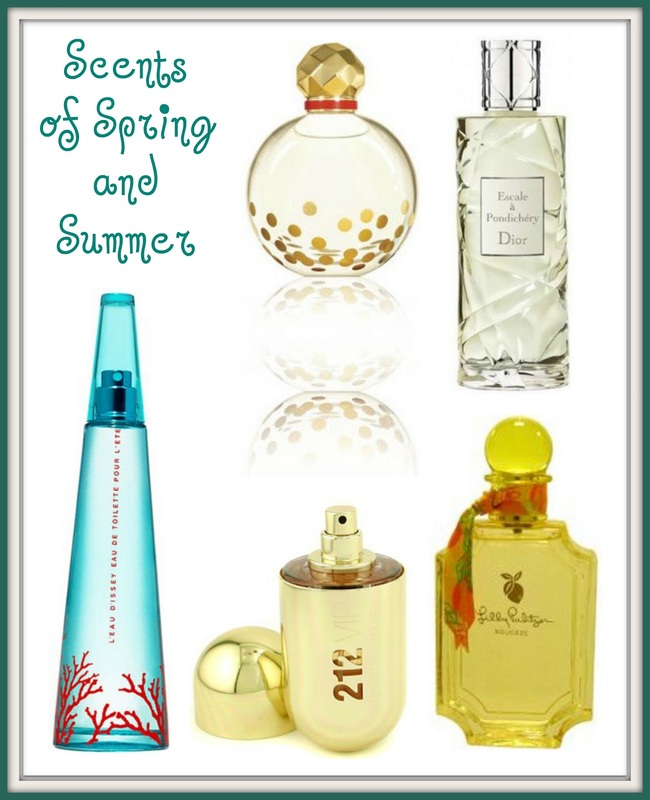 My current favorites are Lilly Pulitzer Wink and L'Occitane Green Tea solid perfume. Mine was Allure by Chanel. Every time I put it on, it takes me back to my freshman year of college! For spring, I love Michael by Michael Kors. It smells like gardenias.